The Wildlife News blog gets a disproportionate amount of comments when wolf related topics appear on a thread compared to other stories. Clearly, this illustrates society’s polarization with the wolf whereby some people love them, while others hate them – or at least seemingly so. However, for those that love them – and there are many – there is a very interesting national trend to, for the large part, ignore how a very closely related cousin – the coyote – is treated. Coyotes and wolves are both in the same family (Canidae) and genus (Canis), so are very closely related. However, the national protests against wolf hunting in the northern Rocky Mountains and the Great Lakes area has seemingly more to do with ethics and humaneness than it has to do with biological recovery, which seems assured. Yet even scientists disagree about how many wolves should constitute a recovered population, what their effects on the ecosystem are, and if we should be killing wolves just to kill them or reduce their population. Much of the controversy, I believe, that is associated with wolves are the unpopular hunting techniques used (such as baiting and trapping) and the apparent lack of input from a diverse constituency that clearly care about wolves (and carnivores in general) but have no input in a system (i.e., wildlife management) where the interests of hunters and ranchers are clearly catered to. Love Wolves and Hate Coyotes? Almost two weeks ago, there was a gunshop owner in NM who was going to hold a coyote killing contest. The winner, who killed the most coyotes over the weekend, would receive a new rifle. Shortly after this was announced there was a huge outcry from many people including local citizens and wildlife advocates, including those who advocate for wolves. I recognized many other wolf advocates’ names in articles and threads on Facebook that were against this contest. This contest did not go as planned, a county or state representative said this hunt couldn’t be allowed on state or public lands. Public land use is another issue that does unite wolf and coyote advocates. Wolf and coyote advocates also share disdain for Wildlife Services. I think since it seems that coyotes have always been, ahem, “hunted” it’s easier to accept in general society. Wolves have not always been “hunted” or shot on sight like the coyote…wolf “hunts” have been legal for only two years now, even shorter than that in WY where wolves will share the shoot on sight policy along with coyotes. Hunters and wildlife agencies say that hunting wolves will bring tolerance of them. Have coyotes received tolerance? No, and it won’t work for wolves either. I share in your concern about coyotes as do many other wolf advocates. In NC, 4 red wolves which are highly endangered, have been killed by hunters killing coyotes at night with spotlights. Many people cannot tell the difference between coyotes and red wolves even in the day time. These wolves were mistaken for coyotes and the Red Wolf Coalition got an injunction to stop the night hunting of coyotes. True, this was done more for the sake of the wolves, but coyotes will also enjoy some protection from this. I hope attitudes regarding coyotes do change and that coyotes receive the respect and admiration they deserve. I question the term ‘mistaken’ when describing how the red wolves were shot in NC. I see no mistake…(mis-take) at all. I see a take. I read this when the IWC ran the article in it’s magazine. Congrats. I agree with the main premise of your piece. When one thinks the wolf has been vilified, it’s unbelievable what coyotes have had to endure. Speaking of coyotes, saw one running out of town today, unfortunately looked as though it had mange as tail was not furred at all. I completely agree with this posting. Following the Jamie Olson nightmare, I tried to get several editors of Wyoming newspapers to cover the story. To my knowledge, none have. I think if people really knew how Wildlife Services treats coyotes and how much they spend doing it, there would be a large scale public movement to defund the agency. I am surprised that more groups don’t really address these issues in depth. Wildearth guardians is one of the few that have. 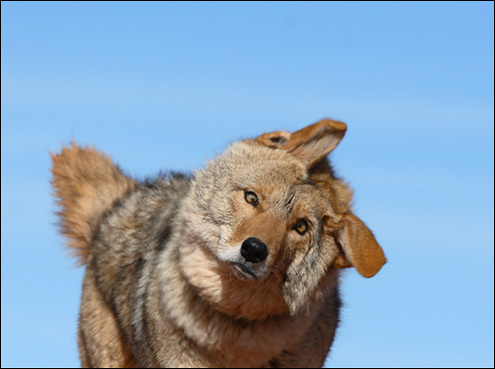 They seem to have taken the lead on opposing the ineffective and probably counterproductive coyote “control” programs. “Predator Defense” out of Oregon. Go to the site & see what they have been doing. Jon, while I share many of your thoughts lets not confuse the coyote situation with the wolf. Coyotes are in no need of rescue or support, the numbers and range increase every year. If anything, they are bad press for wild canines. Coyotes have attacked hundreds of humans in the last 3 decades (mostly in urban/wilderness interfaces) and killed 2. I dont vilify them, but they are a different dog than the wolf. I would sooner face a pack of wolves (as I just did in the Ontario bush this month with no threats presented) then a pack of your eastern coyotes/coywolves. I’ve lived around coyotes my entire life, and like Jon have felt quite safe around them. I wish I’d see more of them. I walk every night late, often around midnight, and occasionally I am fortunate enough to see one or two quite large coyotes or coywolves as I am told they are more accurately described. I am not fearful for my dog or myself but feel fortunate to see them. They are very shy even the large animals, and don’t stick around long which makes me happy. I like to think they run every time they see humans as people do terrible things to coyotes for no good reason. I think you are the victim, like many others, of the perpetual predator danger myth. you say you’d rather face a pack of wolves then coyotes, why? and its probably really unlikely you’d ever see more then 1 or 2 together. They are horribly persecuted, even more so then wolves, and just as beautiful and valuable. sorry that should say: should not be in charge of managing a species that is clearly in contrast to their agendas. Jon are you saying you want the coyote to be protected without any management and to eliminate the hunting and trapping of coyotes all together? There are a lot of what if’s! If so, how do you propose to manage there numbers and with what method because I have not herd of a solid plan yet. Once hunting and trapping is stops then you have the government taking control, which means no control over what or how they manage the coyote. I can’t help but point out that every effort to manage coyote numbers essentially fails long term. So one has to ask: would coyote populations be any different were hunting and trapping reduced or eliminated? Note: The above comment deals only with coyote POPULATIONS. There is evidence that removal of “problem” coyotes is useful for controlling coyote-human conflicts. I believe that is an entirely separate issue. Good question JB. Another one would be – if ranchers were more vigilant about protecting their livestock, especially during calving or lambing season, would there be a need for this annual, incredibly expensive war on coyotes? Robert, sorry been off-line for past 12 hours +. JB essentially answered how I would’ve. Any type of protection would be line for other species meaning that there would be regulation, bag limits, etc. Treating native animals with respect. But yes, there is no evidence that the current system works for populations (that is allowing them to be slaughtered). There is much more evidence that “controlling” individuals may be a more effective technique and allowing non-problem causing animals (which in itself is a subjective definition) to remain on the landscape. In fact, many states already recognize this and allow liberal killing (hunting/trapping, etc) seasons not to accomplish anything other than to satisfy hunters by giving them additional recreational opportunity (I have heard those very words…). Oh, you mean like saying the non-offending individual animals are ‘innocent until proven guilty”, kind of like our legal system assumes with people? I like it. Jon, I have records of years in just S. California where coyote attacks numbered in the dozens each year so I am not sure where your data comes from. Admittedly these are mostly a result of urban food habituation but the numbers are there. Mostly not life threatening but puncture wounds and blood drawn. I have the autopsy report for the 2 year old killed in Glendale CA. You might want to rethink where you take your 4 year old regardless of your experience and expertise. My point was that coyotes do have a track record much worse than wolves and so the average Joe has little sympathy for their fate at the hands of wildlife services. As for domestic dogs…different subject, different politics, but I agree with your statement. Just to split hairs….are you saying a 2 yr old that was killed by coyotes or 1 than was fed upon by coyotes post mortem? Snatched of her walkway in front of the house while her mother and siblings watched…one quick shake and it was over. House was in a wilderness interface and the neighborhood had a history of wildlife feeding. Believe it or not, some “coyote activists” actually accused the parents of covering up child abuse by throwing the child to coyotes. The BS can get quit thick when peoples images of nature are so compellingly negated. Nothing can match our own human gun violence though. The neighborhood I mentioned in my post below is the location of a quadruple murder, there’s a trial going on right now, one victim was a two-year old child, and a fifth victim was left paralyzed. All gun and drug related. Every day somewhere someone is killed with a gun. So I have to wonder about all this zeal about coyotes and wolves. There are going to be conflicts with wildlife with our ever increasing expansion into more and more wildlife habitat. Southern California sprawl is legendary. White, L.A., and S.D. Gehrt. 2009. Coyote attacks on humans in the United States and Canada. Human Dimensions of Wildlife 14:419-432. From this peer reviewed article: from 1960-2006 they found 142 reported attacks from 159 victims. About half did occur in CA but that still equates to only 3 per year in all of the US and Canada. A coyote attack was defined as an incident between a coyote and a person that results in a bite to the victim. The incident you refer to was a 3 year old in CA in the 1980s. The only other coyote-caused death is the well publicized one in Nova Scotia in 2009 (or 2010). I would hardly call these stats a track record given that they live throughout the US and wolves don’t…Furthermore, just last year 2 ppl died in Central Park from tree limbs falling on them. When numbers are so low, it doesn’t even really qualify as a statistical chance in the grand scheme of things. Great article Jon, with lots to contemplate. I will bring exception to the definition of ‘successful’ used when comparing wolves and coyotes. If a coywolf is successful, it is by definition a success to both ‘sides’ however we fraction it out. It’s not a duality. Heck, some phenotypic coyotes may have a good deal of wolf in them. Since many regions rarely test them, how will we ever know? Good points Mark L. I am always amazed how similar eastern “coyotes” look like red wolves for instance. And that isn’t by accident. Eastern coyotes (and why I like to call them coywolves) have a lot of “native” eastern wolf in them. And eastern wolves and red wolves are now being recognized as different species with both more closely related to coyotes than to gray wolves (and hence why hybridization happens). There is absolutely no doubt that there is a huge political reason for states in the east to NOT call these animals coywolves – and I think it mainly has to do with protection (or lack thereof) issues. If they recognize that there is a hybrid here in the NE then they would almost be implicit in their lack of doing anything to protect recolonizing wolves to the landscape whether they are eastern wolves or eastern/gray wolf hybrids (like which like in the Great Lakes area). Wolves, coyotes, & our family dogs are all one. go & kill both species with glee. Mikepost comments are the very reason why this article was needed to be written, coyotes and wolves are different? In fact genetically they are the same practically, and I rarely see wolf advocates sticking up for coyotes, in fact many of them endorse coyote control in the form of wolf predation, though they do wolves no service because the wolf’s enemies make the same claims of the wolf, true coyotes are not endangered but this nonsense and wolf elitism believing that coyotes are more of a danger where wolves are not? Shows Mikeposts ignorance. Wolves have killed two people in North America in the last 5 years, one in Saskatchewan and one in Alaska, do your research. Coyotes are not deliberately stalking people, in fact every incident (as with the wolves, as they have increasingly bit people)if it did not have to do with a rare case of rabies,has to do with food habituation, preventing food habituation resolves conflict with both species, coyotes are NOT more aggressive then wolves, they are just more common. Joe, in spite of my “ignorance”, I do know that coyote and wolf BEHAVIOR is unique to each species regardless of how close they may be genetically. You are correct about food habituation but the related issue is the coyotes ability and often preference to co-exist in urban areas where food-human association is often created even without any deliberate wildlife feeding. The coyotes I have seen are usually lone. If I hear them it has been a single voice at a time. I remember one trotting through my yard who had absolutely zero interest in me. I think people are starting to realize their value in keeping rodent populations in check. 🙂 Foxes seem to get a bad rap also, again, I have seen pairs and heard them at night(at least I think so) but they usually run from people or seem not to be interested in what people are doing. I am not worried about encountering either one. It’s deer season here now and I have already heard gunshots. Ugh. Ida – we hear foxes all the time, you’d know it if you were hearing them. At night they screech its an ungodly sound. My dog usually hears it first, his ears perk up, he sticks his nose in the air and starts the growling and barking that can last for a long time. We live near the beach and its real deserted. The foxes, when they are about roam back and forth on the beach or on the dirt roads. AS they travel we can hear the calls fade in and out sometimes for hours on end. It used to frighten me when I was little as it sounds like something is being killed. They are very vocal…. Jon, Great article, thank you for posting. You bring up some good points. However, I will reassure you that Coyotes do have advocates. I do a lot of volunteer work for Colorado Parks & Wildlife, & City of Louisville (CO) Open Space regarding coyote & education and monitoring. I am also a citizen scientist for a large study on Urban coyotes. I also frequently talk w dog owners in my neighborhood regarding their dogs behavior/interaction w local coyotes. I do love wolves, and coyotes! of course my article was a generalization… but that is great that there are folks like you advocating for local, common species like coyotes. The next step is to get state game agencies to incorporate this popularity into their state mgmt plans by establishing respectable seasons, bag limits, etc, just like for all species – especially one that is social and family oriented – like wolves…. Although I am told coyotes have been in SC for many years, we are just starting to see them in my area. Their appearance is very different from those I see in Yellowstone. Size-wise they compare to a german shepard dog and even have some dark coloration. Occasionally, I hear them in the 750 wooded acres that surround our subdivision. Sounds like a half dozen or more. With the growing feral cat population, they have a ready food source. They are very beautiful creatures that deserve our respect. Connie – is it possible you have a population of red wolves in your area? My guess would be a coyote with red wolf genes. Similar to the coywolves in the Northeast. There just hasn’t been a lot of genetic work in your area to figure out what they are but my guess is that they no doubt have “native” wolf genes that historically existed in the area. Thanks for the link, Nancy. The description of the red wolf certainly fits what I and several neighbors have seen. Think I’ll ask for a wildlife cam for Christmas and try to document. If I film them, Jon, could you identify? These are large (big bone structure), secretive animals who are lucky to be alive with the “shoot anything that moves” mentality in this area. There’s an estimated 3000 plus acres, undeveloped, bordering the Edisto River that *could* support them. A fascinating possibility . . .
BTW, I live in far Northwest New Mexico, but have lived in Houston, other cities in Texas, and Albuquerque. One thing these cities have in common is a growing coyote population. I’m originally from Rockport, Massachusetts, where people began to spot coyotes about 10 years ago. They may be hybrids, because they’re absolutely gorgeous. Big and healthy, with grey coats that blend with Cape Ann’s granite. One frequently makes its way across my parents’ backyard. I first spotted it well before dawn when a boulder “moved” and came trotting out of the fog. Unfortunately, small pets have gone missing all over the area. Fewer domestic and feral cats have meant more small rodents, and even Norway Rats – wharf cats are tough! Unless the coyotes can book passage across the Atlantic, the coast is as far as they can go. I talked with several people about the growing population and various options for control. Most residents of Eastern Massachusetts are very pro animals and animal welfare, so they were predictably in a quandary over what to do. I recommended they find solutions NOW. If they don’t, they won’t like what they and the coyotes will face down the road. An old article but one that may be of interest? Just as I log-in for this conversation I receive this article in my inbox almost summarizing why I wrote this article (although these folks would obviously not be fond of wolves either). “We always shoot coyotes,” Michelle Dye said after her husband and three kids handed over their set of coyote ears Saturday. “It’s a total redneck thing,” Erdman said as he opened the hatch of his truck. He kept the dogs’ bodies because hunters “have a bad name anyway,” he said, and leaving dead coyotes to rot on the side of the road does not help with that reputation. The two little bodies — sans ears, of course — lay facing each other, wine-colored blood pooling near one dog’s midriff, dark against the light wood of the pallet. Is my calendar is showing that it is 1912, not 2012??? By WY time, yes. I saw this too and was about to post it. Its hard to read about parents teaching their kids to do things like this. A big reason for laws to protect carnivores. How can you expect people to learn to appreciate wildlife when they are caught in a vicious cycle of ignorance and cruelty while there are no laws that prevent society from engaging in behaviors that are medievally atrocious. This kind of behaviour is learned and handed down from one generation to the next. Shocking to think anyone can do these things worse yet to know they take their children. In contrast to the story on the family that kills wildlife for fun, I thought I would share my daughter’s story. We spend a lot of time walking/hiking openspace & wilderness. One particular walk my daughter who was only 2 at the time, was trailing behind. She shouted “Wait Mommy I am scared!”. I asked “What are you afraid of? You aren’t afraid of the coyotes are you?”. She replied “No Mommy. I am afraid of humans.” Out of the mouths of babes…. A group I like to support is http://www.projectcoyote.org/ whose main goal is educating people about coyotes and changing public opinion. That’s an odd phrase….abundance of caution. And is it a nursing female? Looks kind of like it. I haven’t heard anything more about it – according to the news reports the coyote was going to be examined at a veterinary clinic and then released back into the wild. Does that sound likely? It struck me as ironic at the time and a little bit of an overreaction, because I would also suggest that depending upon where this poor animal was found in this neighborhood, that it would have more to fear from the humans than vice versa. I’m glad they got the coyote to safety. Suffice it to say that a school going into lockdown isn’t only because of coyotes. It seems,at least to me,canids are more hated than the feline family,such as the lion,puma,etc.Some people try to put some kind of judgement on how the prey is taken down by the predator,especially when it is not executed in away we want to see,fast and clean.Whether on this continent or over in Africa,predators compete for food.The painted dogs in Africa when at the kill,if they don’t eat it fast, they risk losing it to hyenas or even lions.Wolves and coyotes have been on the planet for along time. Confrontation are to be expected when searching for food,defending the food and territory.Doesn’t the fox suffer when the coyotes are around?However,put man in the picture,it is another thing. Yes, I so agree. But yet, we exempt ourselves and we are guilty of some of the most heinous cruelty ever perpetrated against living things, including ourselves. It’s strange to me. I agree.We are suppose to have reason. In Atlanta we now have a very heathy coyote population. they eat a lot neighborhood cats which is the main source of anger toward them. Wildlife removal folks make a lot of money trapping them but we still have them around. Hunting is way down in Georgia here and the deer population keeps growing. the coyotes seem to take a lot of fawns which is a good thing. I like them but I bring my cat in at dusk. My rule is never kill anything you don’t plan to eat and never eat anything that requires a lot of wildlife control to produce. Sorry Mr rancher no beef for me. Three years into this study, the data is suggesting that under certain conditions coyotes are the primary predator of whitetail fawns, even on landscapes that they share with wolves. I could not agree more. Great article and premise. I have long been defending coyotes in my own small ways (letters to the editor, emailing news stations after airing error-filled pieces, spreading correct information, etc.). It amazes me how much folks are willing to now vilify coyotes. As a Chicagoan, they’ve made a huge comeback here–and the result is an outcry of fear from the general public. I’ll never understand it. Do you think it’s the population in general showing fear, or the media looking for a story to sell in the papers/on TV? Remember, there’s media money in fear, not in courage. Scrawny, shy coyotes don’t sell papers. What I find ironic is that any canid labeled “wolf”, regardless of its genetic relationships, automatically becomes popular. Take the so-called Ethiopian “wolf”. Lindblad-Toh et al (2005) demonstrated that the coyote and golden jackal are actually more closely related to the gray wolf than the Ethiopian wolf is. Yet why is it that wolf-centred organizations or fansites exclude these two species? What criteria are used to include the Ethiopian wolf, and not the coyote and golden jackal? It certainly can’t be genetics. After all, the two New World wolf species (lycaon and rufus) are more closely related to coyotes than to gray wolves. Seems to me, “wolf” is just a label environmentalists slap onto newly found endangered canids, in order to kickstart their PR. Why not just give them an Anglicized variant of an indigenous name? That’s how the coyote was named, and it was once common to call Ethiopian wolves “cuberows”.